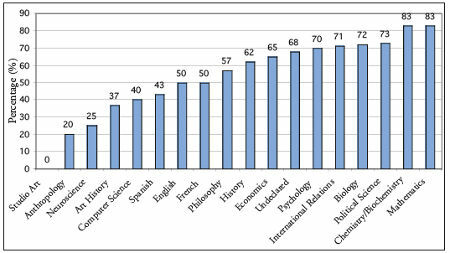 Here’s a chart that shows the virginity rate at Wellesley College according to the student’s major. Wellesley College is a all girls college in Boston Massachusetts. Anyhow, as you can see there is a 0% virgins in Studio arts, there’s more pervert in Spanish class than English and French, and lastly people who’s quite nerds are virgins.